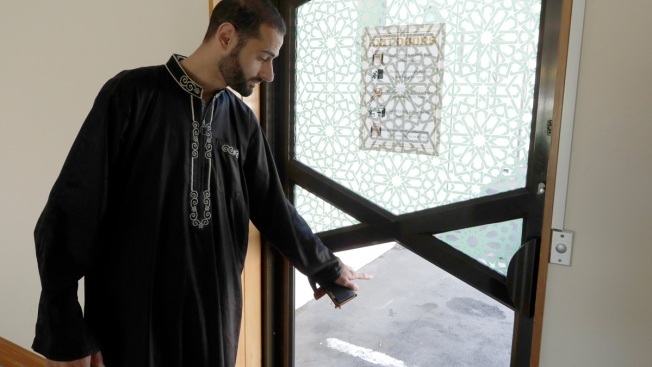 In this March 27, 2019, photo, Al Noor mosque volunteer Khaled Alnobani gestures as he explains his escape through a glass door panel when a gunman burst into the mosque on March 15 in Christchurch, New Zealand. Alnobani says he thinks as many as 17 people may have died trying to get out through the door. "I tried to open the door," he said. "But it doesn't open." 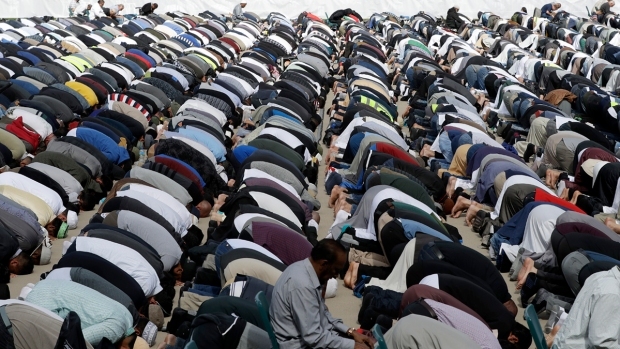 Shagaf Khan, the president of the Muslim Association of Canterbury which oversees the mosque, said the door was closed and latched much like the front door of a house. He said it wasn't locked, although worshippers may have believed it was in the confusion. He said an electrician had tested the new electric locking system on Thursday, and then disengaged it for Friday prayers. He said that to open the door, somebody needed to turn a lever. It was just happenstance, and perhaps the cool weather that day, he said, which meant the door wasn't wide open as usual. 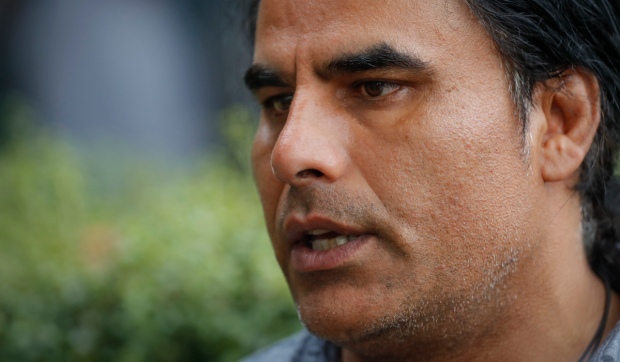 "If it had been completely open, it would have been easy for people to get out," he said. "But nobody was prepared for this. We were prepared for an emergency like a fire or an earthquake, and people would still have time to get out. This is something totally different. You don't put this in your emergency plan." Alayedy said that in the confusion, he can't be sure if he simply failed to turn the lever properly or if something else stopped the door from opening. Alnobani, said he, too, tried to open the door and it didn't work, and he's familiar with the lever. He said he believes the door was electronically locked. Simply pushing a button next to the door would have unlocked it, he said, but nobody knew about the new system. Alayedy, 30, said that on the day of the attack, he'd been listening to a holy speech by imam Gamal Fouda when he heard six or seven shots. He thought it was an electrical fault at first but then heard screaming and ran for the door. Because he couldn't open the door, he said, he tried punching the hexagonal piece of glass in the lower part of the door. When that didn't work, he drove his knee through it, shattering the glass, and then kicked it out. He crawled through and ran for safety. Behind the mosque, Alayedy said, he began helping people to escape over a fence but couldn't get over it himself because of his injured ribs. Alnobani said that when he first came to the mosque that Friday, he'd noticed the side door was shut and considered opening it but then saw there were some older worshippers. It was a little cold and windy outside, he figured, so he left it alone. Alnobani said he also managed to crawl through the door's smashed glass and run. He returned to help rescue a young boy whose father was shoving him through the opening, he said, and then helped the father as well. Chenafa said he's still sad and confused, and finds it hard to sleep. And he doesn't know what to believe about the door.